Tonight I have a special treat for you. The very lovely Kristine of Adorning Al has very kindly agreed to do a guest blog post with some awesome tips on how to make your retail space beautiful. Visual merchandising is the art of presentation and an integral part of any business’ marketing plan – no matter how big or small your business! To build long term brand loyalty and maximise sales, projecting the right image is crucial. As a visual merchandiser for 10 years I have worked on and seen many effective and beautiful displays, and just as many bad ones. Draped satin fabrics and fake flowers are just some of the bad props I’ve encountered on my travels. 1) Graphics and signage: use attention grabbing, yet clear graphics to communicate your brand. Forget fancy fonts or too much information - get straight to the point. Use computer graphic signage or a designer to help you with signage and price tickets. Do not scrimp here, it is all part of your image and reflects what you’re about. 2) Trends: When you next go shopping at a large retailer, take note of what makes you stop and look at their window, then enter and spend $$. The story the retailer has created has silently led you in and before you know it, a sale is done. So, jot down these steps and review… whether it was a catalogue, poster, price point or display prop, these are the points you need to consider when creating your own display style. 3) Space: Think about the total space you have for display. Use the space above and behind your stand, as well as the space on your trestle table or in front of you. Get creative and practise your display well before market day – it will mean less stress on the day and a quicker set-up time! 4) Synergy: Incorporate visual elements like a colour scheme, material type, use props like flowers, ceramic or glass bowls, build height and create levels by using boxes, use backdrops, the list is only as limited as your imagination! Group similar items to make it easy for the buyer to purchase and make sure there is flow. Group items together by size, colour, or product type. Make sure any props used complement, not distract your product. 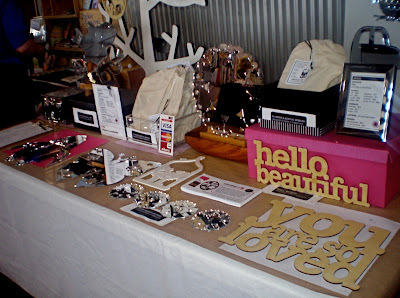 5) Think outside the box: With so many stalls at markets, you want to grab the attention of potential buyers. What is so special about you that makes people want to purchase your product instead of those from the stall next to you? It maybe as simple as using lights or a lamp, a coloured table cloth or backdrop that make your items stand out more. It’s the little touches that can make a BIG difference. You have only have a few seconds to catch a buyer’s eye… so remember you want to make it as easy as possible for customers to view and buy your product. Keep it clean and simple. Create your own style and be passionate about visual merchandising!